The 2018 World Happiness Report named Finland as the world’s happiest country. In fact, the top four of the 156 countries measured were all Nordic – Finland, Norway, Denmark, and Iceland (“unhappy” Sweden popped in at number nine. The good old US of A? Eighteenth). The 2018 report is a cumulation of 2015-2017 while the prior report contained data from 2008-2010. Comparing the two reports, you may want to explore Finland as a second home, if for no other reason than improving your mood. The latest report shows that the US happiness index is down 0.315 points while Finland gained 0.100 points. This may not seem like a lot, but the index is an eight-point scale, making a 0.415 point separation a significant 19 percent. Does living on the top floor of most high-rises still feel like living in the basement? Chicago’s 100-story John Hancock Center will change all that. Whereas the tallest residential home in Dallas is a 42nd floor penthouse, the Hancock’s condos don’t start until the 44th floor and continue all the way to the 92nd floor. Completed in 1969, the Hancock Tower is one of the most recognized buildings in Chicago and offers up some surprisingly inexpensive homes with incomparable city and Lake Michigan views. Sure, Chicago winters are unkind, but the summers, when second home ownership has its privileges, offer a plethora of activities to shake off the cold and grey. The Hancock is in the thick of everything Chicago has to offer. It’s right on Michigan Avenue in the thick of the city’s tony shopping. It’s a two-block walk to the beach and is a 10-minute taxi to Millennium Park and the Art Institute of Chicago. Sizes range from 550-square-foot studios to ~1,800-square-foot, three-bedroom units. Of course, with over 700 units, many have been combined for larger spaces. Prices are surprisingly affordable with studios starting just below $200,000 while three-bedroom units trade in the $500,000 to $800,000 range depending on renovation. Let’s look at both ends of the market and with 703 units, there’s always something great for sale. Last month I wrote an Oahu market update detailing the prior year’s slight price appreciation. I also pointed out that it takes hard work to lose money in Hawaii if you have time. In other words, don’t buy high and sell low as the Dallas Police and Fire pension funds did. But all those number-y things get confusing, so here’s a concrete example of how two units in the same building have performed over time (spoiler: GREAT). Welcome to Waiea where two penthouses kiss the Pacific Ocean for a combined $71 million. It was here that we met Erik Hinshaw of Hawai’i Life Realtors to view these two staggering properties (the same Hawai’ian Life featured on HGTV). We? Yes, coincidentally, Dallas high-rise Queen Sharon Quist with Dave Perry-Miller Real Estate was in town poking around with a client and joined me on the tour. 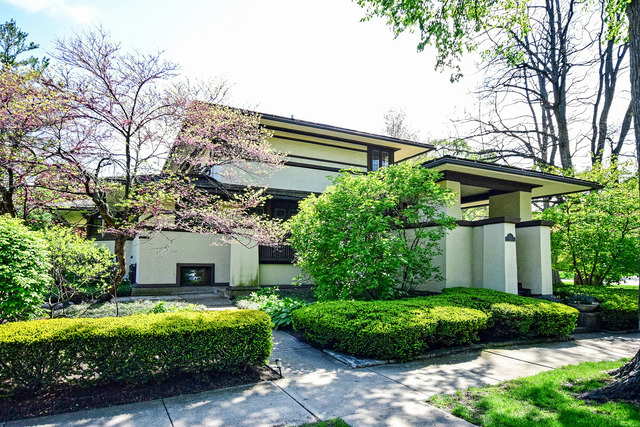 From the Archives: Own a Frank Lloyd Wright Prairie Home in Elmhurst, Ill. I grew up around Frank Lloyd Wright architecture, so when I saw one of his homes on the market near my old stomping grounds, I had to share it with you. It’s a type of architecture not often found in Dallas (one house and the Kalita Humphreys theater are all I know of) where prairie style means something completely different. Often when I write about second homes, I’m writing about areas to consider. This time I’m dictating exactly which second home you must purchase. I’m doing this because it’s one thing to impress your friends by owning a second home, but it’s a complete mic drop to add that it’s a Frank Lloyd Wright prairie-style home.